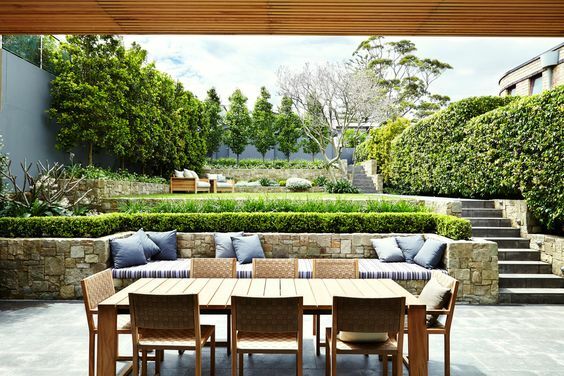 What is a retaining wall and why are they essential to a landscape garden? Retaining walls create a strong barrier to hold in soil, prevent storm water runoff “erosion”, establish functional levels for planting and entertaining. Gardens with gradient slopes lose a lot of Nutrients and Water, Heavy rain can cause extensive damage to boundary walls and your home, also causing Rising damp, erosion and planting difficulties. Retaining walls can be constructed with materials such as Steel, interlocking concrete pavers, Concrete, Bricks or Natural stone which blend in with the environment with very little maintenance. There are many advantages in having a retaining wall in your garden, they create a different dynamic to your landscape, protect the land, create more planting & living spaces, holds in nutrients, moisture & in return keeps grass lawns healthy.